Last month, I was in New Jersey for work, and my colleague and I heard people at the company we were visiting talking about this sandwich that fed six people for dinner and lunch. We were skeptical, but the hook was set. We were told that it was a place called Harold's New York Deli and that it was just around the corner. So, for lunch, we decided to give Harold's a try as we are both suckers for a good pastrami sandwich. When you walk in, here is the sign. 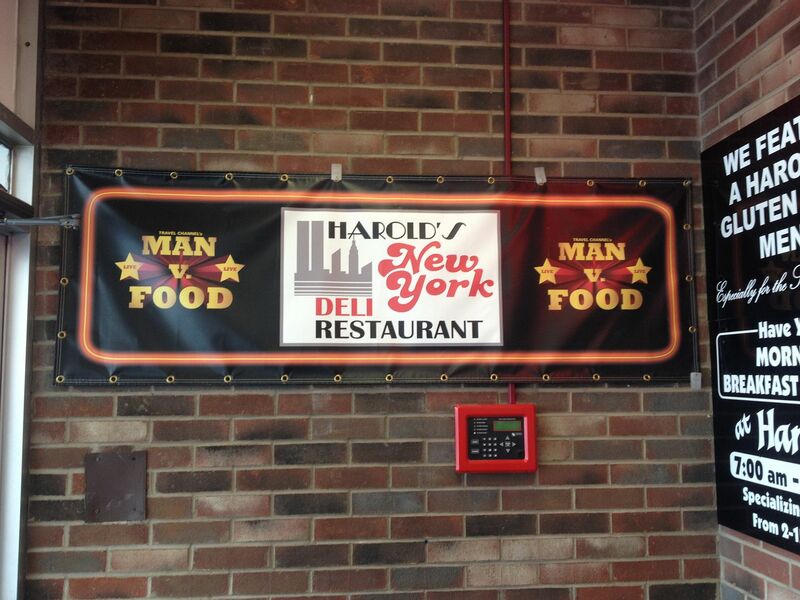 Ah, my first Man vs. Food establishment. Perhaps the rumors were true. Then, you walk through the door and see another clue as to what was in store for us. Really, a cake that big? Does it come with a side of insulin? My colleague and I look at each other and start to think that our lunch may become a dinner. We ordered the pastrami sandwich that the menu said "serves 1-3" and Chris ordered a root beer float as well. 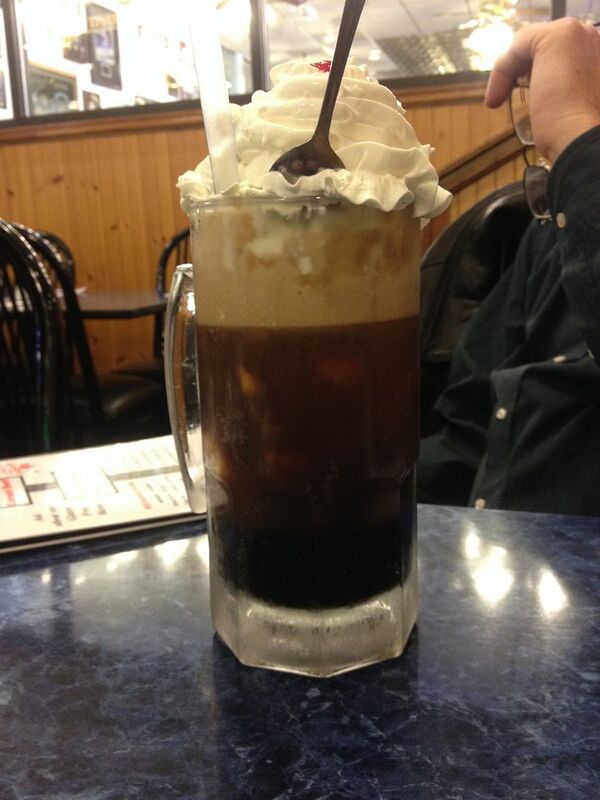 A full liter of Stewart's root beer, a pint of house made vanilla ice cream, and a mountain of whipped cream. While Chris started down the road to a sugar coma, I decided to check out the World's Largest Pickle bar. 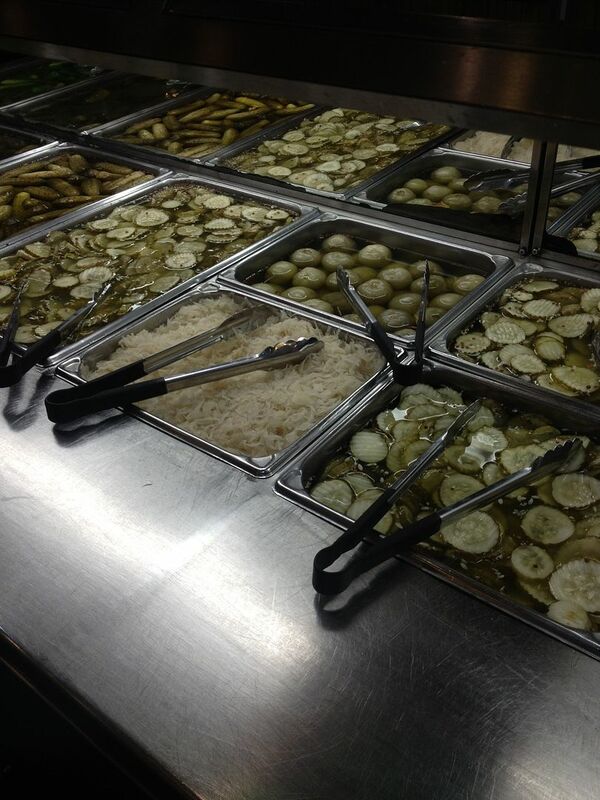 This pickle bar had it all. Barrel pickles, dill, sweet, half and full sour pickles. They also had pickled tomatoes and three types of cole slaw. I picked an assortment with some vinegar slaw and two slices of fresh, Jewish rye bread. By the way, the Jewish rye was outstanding. A crispy outside with a soft inside. Why was it stacked at the end of the pickle bar? Well, I got my answer when I sat down at our table. When I sat back down, Chris was half way through his root beer float and was starting to twitch from the infusion of sugar. Also, this monument to smoked beef was looking me right in the eye. Serves one to three? Try four people comfortably. 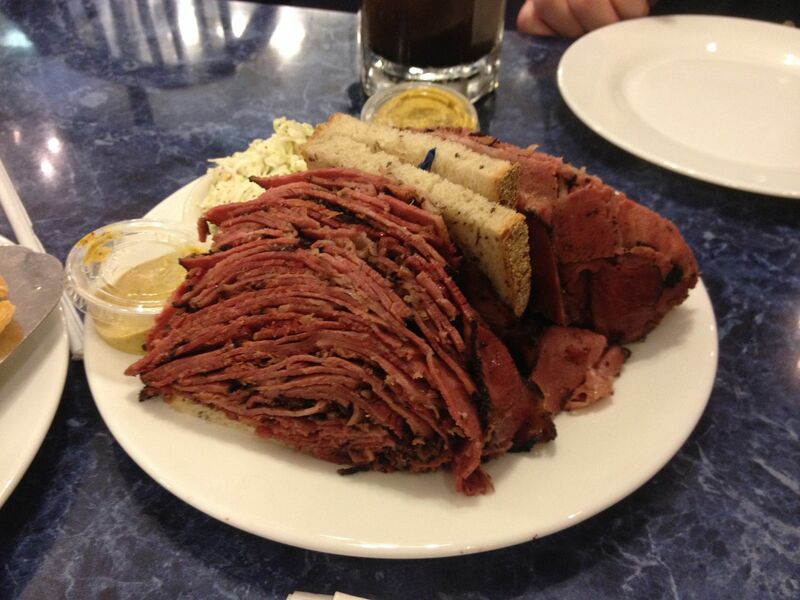 There was a good pound of pastrami on each side of that sandwich. It even came with a side of fries! Now I see why they had bread stacked up on the pickle bar. The pastrami was good. Tender, juicy, a slight kiss of smoke and just the right amount of fat and seasoning. We finished it all and Chris even polished off his float as well. 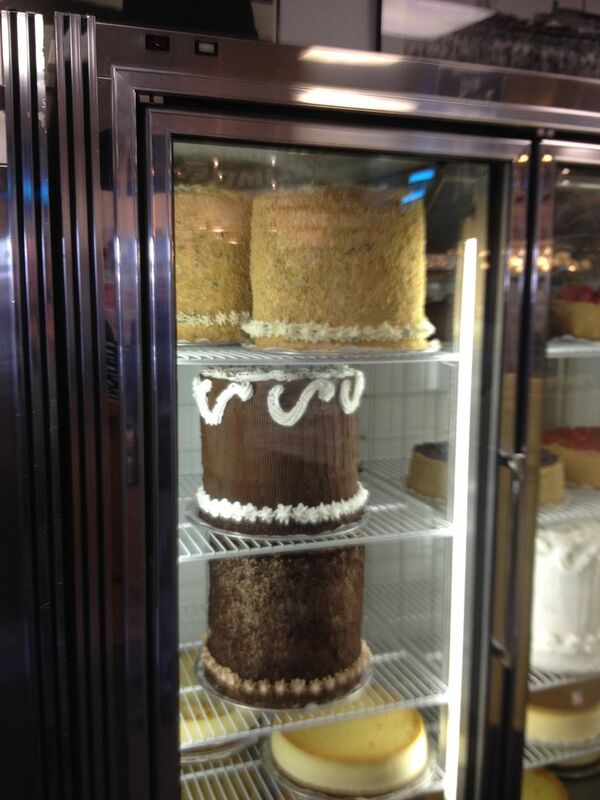 We passed on a slice of cake that served "one to three". My suggestion if you go to Harold's, skip breakfast and plan for a light dinner. Overall rating, A. That is my kind of place. It can be a disappointment going to a fancy restaurant and leaving hungry. 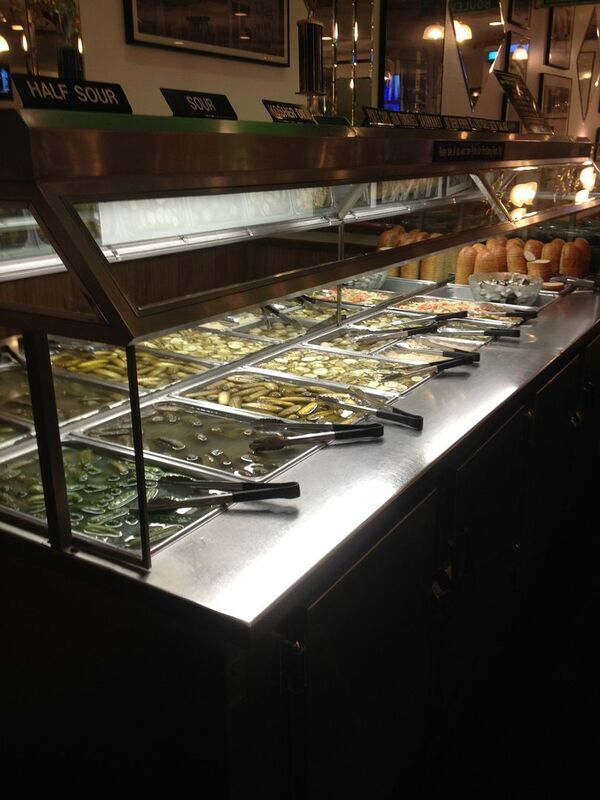 I could make a lunch just at the pickle bar. OMG. That's a mountain of a sandwich! It certainly was Zoomie. Way too much for 2 people, bit we were not denied! I wish I had a deli like this in my back lawn Kevin. Good stuff.